The postwar political climate may not have been kind to Jules Dassin, but thankfully, history and the Criterion Collection are. 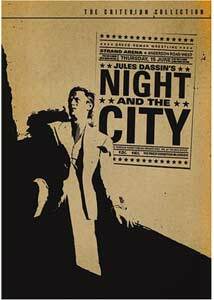 As they have done for Rififi and Thieves' Highway, here the folks at Criterion go all out for Night and the City, a movie not especially highly regarded in its time, and remade poorly by Irwin Winkler and Richard Price. What you'll find here is a sharp, smart, taut film noir, odd in many ways but exemplary of the genre in others, and a fast-paced and gorgeously photographed story. The title of the movie puts forward two of the crucial aspects of almost all noir—these pictures are thoroughly urban, and the action begins only when the sun goes down. The city in question is London, though our hero is from the States—Richard Widmark plays Harry Fabian, a small-time hustler forever on the make, in the rich Sammy Glick tradition. There's always a scheme with Harry, and today's has to do with getting some seed money to invest in a greyhound track; his girlfriend, Mary, knows that this one will go kablooey just like all the others. Harry works as a club tout—that is, he finds rich, unsuspecting customers for the club in which Mary works, where the men are overcharged for drinks and for the time and attention of Mary and her cocktail waitress colleagues. (It's not too tough to break the Hays Code on this one; Dassin couldn't say it, but it's little more than a brothel, with Harry pimping for the girls.) Running the club is the overweight and overbearing Phil (the splendid Francis L. Sullivan) and his wife, Helen (Googie Withers), who puts up with Phil because of what he's got stuffed in the safe. Harry thinks finally his ship has come in: he's going to take on Kristo, the mobbed-up wrestling promoter who's got a monopoly in London, by putting on a bout blessed by Kristo's father, Gregorius, unhappy with the charlatanism that his son has used to taint the sanctity of his sport. Harry owes money to everybody all over town, but he couldn't be more sure that this is his big chance; watching him play out his destiny makes this a film full of pity and terror, for Harry is a fabulously well-realized character. Dassin deserves a huge amount of credit for that, but at least as much praise should be heaped on Widmark, an actor who was so great at playing bad guys, and yet never quite got his due. With his peaked lapels and shabby boutonniere, Widmark's Harry is always on the make; he's at once charming and menacing, and Widmark is manic, jacked up, and sweaty throughout almost the whole movie. Harry is almost always on the go, and so the questions about him always recur: what's he running away from? And where's he going in such a hurry? The beautiful Gene Tierney doesn't get much to do as Mary, but she's lovely nonetheless doing it; and structurally it's an odd movie, giving over a little too much time to the sanctity of Greco-Roman wrestling, and featuring a penultimate climactic sequence that hasn't much to do with our hero. (Giving an especially fine performance, however, is Stanislaus Zbyszko, as Gregorius, both a fearsome world-class wrestler in the twilight of his years, and a patriarch inspiring both fear and love in his boy.) As with many films in the genre, this one is creepily fatalistic about the inherent folly in all human endeavors, and is brutal about what it perceives to be the fictions of loyalty and love. It's a highly stylized story, and not a very straightforward one; but if you're a fan of the genre and the period (and heaven knows I am), you're likely to find much to love about Harry Fabian and his sad world. Image Transfer Review: At times it looks like you could cut yourself on some of these images, they're so sharp. The movie looks magnificent here, with saturated blacks, a dense and carefully calibrated grayscale, and very little grain. I don't know of a noir picture on DVD that looks any better than this one. Audio Transfer Review: The mono track shows its limits; the actors' intensity and Dassin's restraint means that there are many scenes of the characters whispering feverishly at one another, and at times the dialogue can be challenging to make out. And the scoring, as well done as it is, can overwhelm the actors dynamically. But there's almost no hiss, pop or crackle here, which is a huge, huge bonus. Extras Review: Glenn Erickson, who may be familiar to you for his online column, DVD Savant, provides a commentary track jam packed with information�he's especially good on comparing the shooting script to the novel on which it was based, and contrasting this American cut of the film with the one released in Great Britain. (The two versions don't seem to vary too remarkably; still, one can dream of a DVD release featuring both incarnations, copyright laws be damned.) The book was cleaned up a whole lot for Hays Code purposes, and Erickson makes apt comparisons, especially to another great noir yet to see its DVD release, Nightmare Alley. He's armed to the teeth with information—if you're dying to know the birthplace of every cast member, he's ready to tell you; he's also endlessly worshipful of the movie, and can get a little highfalutin' every now and again. (Here's a typically florid declaration—Erickson says that the movie is "an existential no man's land where only the guilty and the desperate roam.") All in all, a solid job, though. Even more arcane is the accompanying essay by film professor Paul Arthur; you're better off getting down and dirty with the three accompanying documentaries. The first is a recent interview (17m:49s) with Dassin, who seems like a wonderful man and an accomplished raconteur. Much talk is given over to his being blacklisted, and his knocking heads with the film's producer, Daryl Zanuck; the director also sheepishly admits that, prior to making the movie, he hadn't read the novel. He's rapturous about Widmark especially, and wanted the actor to play Hamlet under his direction. 2 Versions, 2 Scores (23m:53s) is hosted by Christopher Husted, who talks us through the historical circumstances leading to two versions of the film: for the American one, on this disc, the score is by Franz Waxman, while the slightly longer British cut was scored by Benjamin Frankel. It's a great study in the power and importance of movie music—Frankel's score is more lyrical, Waxman's more menacing—and, as you might expect, there's a good deal of compare and contrast. Also, this documentary features extended scenes that were included in the British release, but not the American one. Finally, there's a 1970 French TV interview (25m:23s) with Dassin; it's got a crazily moving camera, a reporter asking softball questions ("Did you work with any other stars back then? "), and Dassin spinning stories of old Hollywood (e.g., dinner at Joan Crawford's house) and about his personal bête noire, Elia Kazan. A razor-sharp noir in a beautiful transfer, with a smart, informative package of extras.